Some important news has just come in, mandatory and voluntary evacuation notices from the Santa Barbara County Office of Emergency Management–attached and pasted in below. The Ladera campus will be under mandatory evacuation as of noon tomorrow, the Lambert campus will be under voluntary evacuation at noon. Now that we have been through the fires, our next trial by the elements will be water, I’m sorry to say. For those of you who live in mandatory evacuation areas please do not come into work tomorrow if you need to leave or to protect your families and move to safer areas. For those in the Voluntary evacuation zone or outside the danger zone we would appreciate your coming at least for half a day as we have students at Ladera and a retreat center event with participants already there. If you need to evacuate we understand. We will be moving those staying on Ladera to safety and finding appropriate quarters for the classes. We will need some help to make this occur, so if you can come in it will be deeply appreciated. Everyone will be evacuated from Ladera before noon tomorrow when the mandatory order takes effect. Some of us will continue to work at Lambert for the present but continue to evaluate the situation as we go forward. My apologies for the short notice, but this information is very new. Evacuations have been issued for areas below the Thomas, Whittier, Sherpa and Rey Fire Burn Areas beginning at 12pm (noon) on Monday, January 8, 2018 due to an approaching winter storm. This strong storm is expected to produce heavy rain, high winds and extremely dangerous flash flooding, mud and debris flows. Flash floods, mud and debris flows can happen with little or no warning. It is important that you understand the seriousness of the situation and follow the direction of authorities. 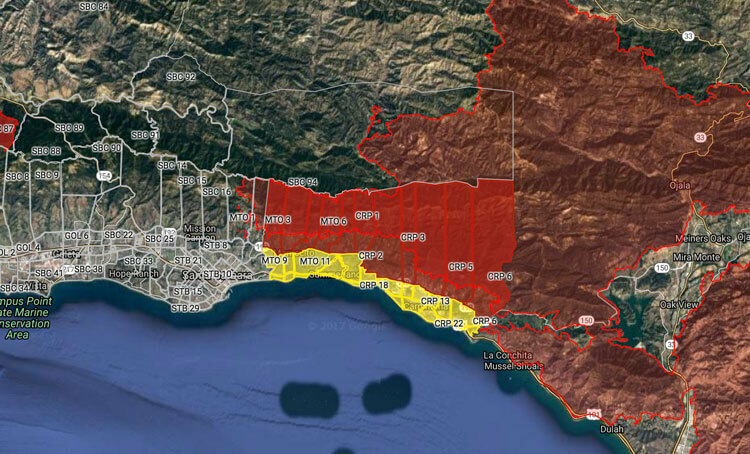 A MANDATORY EVACUATION ORDER has been issued for unincorporated parts of Santa Barbara County, Montecito, Summerland, and Carpinteria including all areas NORTH of Hwy 192, EAST of Cold Springs Road, and WEST of Hwy 150/the County line. Also included in this Order are the areas along Tecolote Canyon, Eagle Canyon, Dos Pueblos Canyon, Gato Canyon, and the Whittier burn areas near Goleta. People in these areas should take action to leave no later than 12pm (noon) Monday. A VOLUNTARY EVACUATION WARNING has been issued for all areas SOUTH of Hwy 192 to the ocean and EAST of Hot Springs Road/Olive Mill Road to Hwy 150/the County line. People in these areas should stay alert to changing conditions and be prepared to leave immediately. If the situation worsens or you feel threatened, leave immediately or take protective actions. Do not delay in taking action to protect you, your family, your animals and your property. If you fail to take action and decide to stay in these areas, you could be stranded with no way for rescuers to reach you if you need help. An evacuation center will be set up and announced on Monday, January 8, 2018.To determine if your property is in the impact area, please go to www.countyofsb.organd refer to the interactive map. If you do not have access to the Internet, or need assistance evacuating, call 211 or (800) 400-1572. For help, reply HELP to 888777. To cancel, reply STOP to 888777. No charge but Message & Data rates may apply. 2 messages.